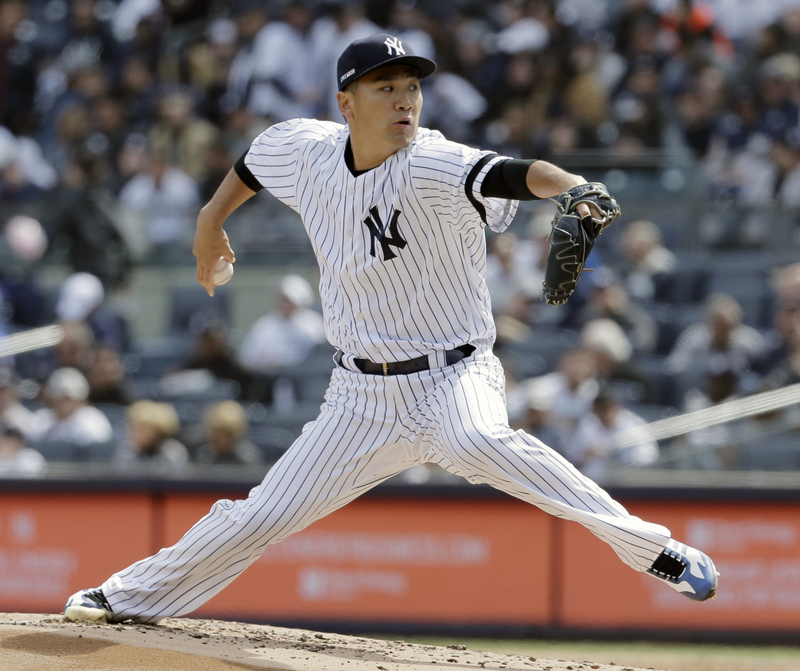 NEW YORK - Right-hander Masahiro Tanaka got an Opening Day victory in his fourth try Thursday as the New York Yankees started the season with a 7-2 win over the Baltimore Orioles. The 30-year-old Tanaka became the first Japanese-born pitcher to start four openers in the major leagues, surpassing Hideo Nomo’s three. He was picked as the Yankees’ starter for three consecutive season openers from 2015. In front of a Yankee Stadium crowd of 46,928, Tanaka (1-0) allowed two runs — one earned — and six hits over 5⅔ innings, striking out five of the 22 batters he faced and walking none in his 83-pitch outing. “I got a big boost from my teammates in the first inning,” Tanaka said of Luke Voit’s three-run homer off Orioles starter Andrew Cashner (0-1). Voit, whose home run traveled 130 meters, finished with four RBIs thanks to a bases-loaded hit-by-pitch in the fifth. Greg Bird also homered in the eighth. Voit drove in his fourth run when he was grazed above the elbow with the bases loaded in the fifth against Mike Wright to make it 5-1. Aaron Judge reached four times and scored three runs, while Giancarlo Stanton also reached three times and scored a run. The Yankees won consecutive season openers for the first time since triumphing from 2005-08. 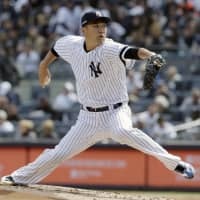 Tanaka, who had been 0-2 with a 9.49 ERA in his three previous season-opening starts, replaced Luis Severino, who did not make the start because of right shoulder injury. In Los Angeles, Joc Pederson and Enrique Hernandez each hit two of the Dodgers’ eight home runs against Arizona. Los Angeles set a major league record for homers on Opening Day and tied the franchise mark for any game. Hernandez, Austin Barnes and Corey Seager all homered in the fourth inning to chase Arizona ace Zack Greinke (0-1). Max Muncy, Cody Bellinger and Hernandez connected in the seventh for the power-packed Dodgers, whose pursuit of a third straight National League title got off to a thrilling start. Ryu Hyun-jin struck out eight over six stellar innings as Los Angeles’ first Opening Day starter not named Clayton Kershaw since 2010. In Milwaukee, center fielder Lorenzo Cain soared above the wall to rob Jose Martinez of a tying home run for the final out, lifting Christian Yelich and the Brewers over St. Louis. With at least one Cardinals player in the bullpen already raising his arms to celebrate, Cain pulled back the pinch-hit drive by Martinez in right-center. A fired-up Cain flung the ball high into the air as Milwaukee players poured onto the field to celebrate. In Washington, Robinson Cano homered in his first at-bat for the Mets and added a late RBI single, and Jacob deGrom outpitched Max Scherzer as each struck out at least 10 in a sterling matchup between the winners of the past three NL Cy Young Awards as New York edged the Nationals. A day after signing a $137.5 million, five-year contract, deGrom (1-0) fanned 10 with one walk and five hits in six innings, setting a major league record with his 30th consecutive start allowing three runs or fewer. The lanky righty topped runner-up Scherzer in Cy Young voting last season — and got the better of him in the win and run columns on this day. Scherzer (0-1) was charged with both Mets runs in 7⅔ innings, with 12 Ks, three walks and two hits. In Philadelphia, Bryce Harper struck out twice in green Phanatic cleats in his $330 million debut and bowed to thousands of fans in No. 3 jerseys who gave him rousing standing ovations during the Phillies’ win over Atlanta. Harper had the city electric in anticipation for his first game in Philly since he signed a $330 million, 13-year deal. He went 0-for-3 with an intentional walk and failed to deliver a big hit — but no worries, the Phillies picked up the scoring slack. Harper’s presence in the lineup helped blow the game open when the Braves walked the lefty slugger to load the bases. Rhys Hoskins followed with a grand slam off reliever Luke Jackson that broke open the game. In Toronto, Jordan Zimmermann took a perfect game into the seventh inning, Christian Stewart hit a two-run homer in the 10th and Detroit topped the Blue Jays.